Now that it’s incredibly cold and snowy around here, but with the solstice long past, the garden folks are working on seed orders. With that in mind, here are some reflections on how the boat farm went in 2013. Overall, progress was made. It’s still experimental, and a source of treats, rather than a tremendous amount of food, but that’s mainly because it did not get my full, undivided attention. The next round will be easier, with a specific plan in mind, and a firmer sense of what works. For starters, being diligent about planting every few days would pay off nicely. Sunflower sprouts fill in well, and once they get going one can harvest each day for about a week from one planting, picking the taller individuals in each container, with new ones growing to harvest size by the next day. They feel substantial when you eat them, so a handful of thinned plants actually makes you feel like you’ve had some fresh vegetables. While the weather is warm, and there are many hours of sun each day, they grow quite enthusiastically. Clouds do not seem to be a big problem, but the shortening days in the fall brought about a gradual end to the success of this crop. This stands to reason, considering that they are SUNflowers! Once the weather got cooler and the days shorter, I started to focus more on buckwheat sprouts, also planted in a thin layer of soil. These grew quite nicely, so long as the buckwheat was fresh. Old buckwheat that had been in my cupboard for a couple of years (how can that happen??) did not sprout well at all, and was better for cooking. But buckwheat with hulls, bought recently in bulk from the natural food store, grew just fine. This is a more delicate plant, with leaves that don’t have a lot to them. The leaves are broad, but tissue paper thin. Still, they are tasty, with a mild, unspicy flavor. With a diligent planting schedule, and being careful to not let them dry out in the sun, they are a worthwhile effort. Nothing beats sunflowers in their favorite season – thick-stemmed, with sturdy leaves, and growing like a shot – but once the season goes by, it’s time for other possibilities. Buckwheat fills the bill. One approach that was more of a success this year had to do with watering, for all the different plants. Originally I had the idea that when planting the seeds it was good to water the soil directly, making it thoroughly moist though not soaking wet. However, little bits of white mold were a frequent issue in both sunflowers and peas, and eventually I tried simply spritzing the top of the soil after the seeds were in. This was much more successful, and mold stopped being a problem. Who would’ve thought that seeds would sprout without soaking, and with such a light application of water! They were spritzed enough to be moist on top once or sometimes twice a day, but were definitely dry at times also. The soil underneath was barely moist – and yet this worked. Another success had to do with learning to live with the fungus gnats. Though I was originally hoping for complete eradication, eventually I realized that the issue was more one of balance. Starting with fresh soil in the container with each planting made a big difference with this, and the only time that they became a problem again was when I neglected to harvest the sunflower sprouts that had quit growing in the fall, short of their normal harvest size (I kept hoping that they’d get bigger). Previous to that, the long-term pot of parsley did have a few gnats, but they didn’t go crazy, and they did not start to take over the other containers. I do think that the parsley, because it was in a long-term, deep container of soil, made it impossible for the boat to be fungus gnat free, but that parsley sure was good! One or two gnats every now and then felt like a worthwhile trade-off. Next time I’ll understand that when the sunflower sprouts stop growing, then it’s time to harvest the final crop even if they are only an inch high (rather than the normal 3 to 5), and move on to buckwheat. Fast growth, making for frequent changeover of container soil, pretty much took care of the fungus gnat issue. Then there is the subject of fertilizing. This is really important for plants that are in containers ongoing, like parsley, and lettuce, and there are knowledgeable sprouters who say that it makes a difference for short-term crops in an inch of soil, also. I’d agree with that, for the sunflowers, and it was obvious with the parsley and lettuce. There is organic fertilizer, and compost, that are fertilizing options, either applied directly to the top of the soil, or soaked for “tea” that is then applied when watering. And I’m going to go out on a limb here and share that there is another source of perfectly healthy, and safe, fertilizer in abundant supply on a boat. This would be pee, which is a fantastic source of nitrogen. It has to be diluted with water at least 10 to 1, which takes care of the odor issue, as well as being important for the plants, so they don’t “burn.” If potted plants such as lettuce and parsley are given a soaking water with this diluted mixture once a week, they grow like crazy. I have not gotten brave enough to try this on the indoor sprout plants – they seem too close to the ground that is being so watered, and beyond even my admittedly fringy comfort level. But it would probably be fine. Plants in the cockpit, that can drain over the side, do just fine, and it’s so simple! It’s important to make the distinction between using urine for vegetable garden fertilizer and using humanure compost. Urine is generally sterile, while a much more involved process is required before composted solid waste can safely be considered for food plants, and some folks argue that it should not be considered for food plants at all, due to potential bacteria as well as heavy metals. However, urine is a different story, and can be very successful. Because we are talking about small boats, and self-sufficiency, it has seemed that the discussion of boat-farm fertilizer would be incomplete without mentioning it. Another thing that I learned in 2013 was just how much very fine salt spray finds its way across the cockpit – and the plants don’t like it. 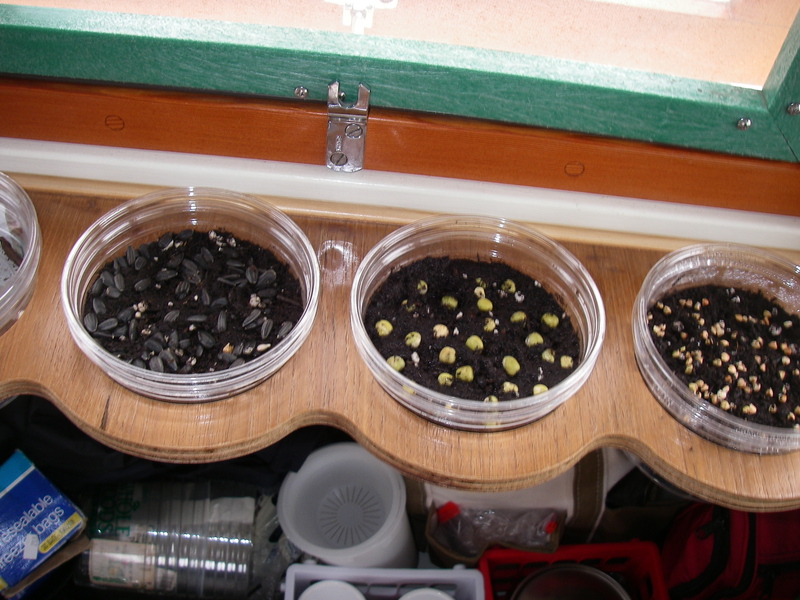 Once I recognized this, I started moving lettuce containers into the cabin for sailing, and they started doing much better. Previously, I had just been covering them with a piece of sunbrella fabric when there was visible spray, and wondering at the little brown flecks on the leaves even when there had been no spray at all. Finally I started paying attention to that bit of mist that I could feel on my skin when sailing, even in very mild conditions, and the puzzle was solved. In the cooler weather it had been unnoticeable, with all the warm clothing, but was more obvious after the weather warmed up. Now, the shuffling of plants is a small chore, but very worthwhile. Overall, while the boat farm is a work in progress, it is showing more and more signs of being workable. It’s fun to have the fresh greens, and sailing alone it’s rather nice to have the company. The little plants are festive in the cabin, green and growing in their special shelves, and I’m looking forward to expanding. Just think what a real gardener could do with this concept! I’d love to see. Lots of useful experience here! I presume you are mainly after sprouts, and for taste and perhaps health reasons; since to actually produce food (i.e. calories) would take much more time, and space that is simply not available on any boat. It’s true that I’m not after calories – leafy green vegetables aren’t so much of a source for those. But definitely for taste, and satisfaction, and vitamins, as well as the various less tangible benefits of eating fresh vegetables, which I guess falls under the category of health. The boat farm has, so far, noticeably extended the time that I’ve gone between shore support resupply as far as vegetables. And even better, when the vegetables are growing, they need no refrigeration. Further up the coast of Maine, and earlier in the spring in southern New England, the water temperature is low enough that harvested-from-land vegetables stored low in the boat do quite well. 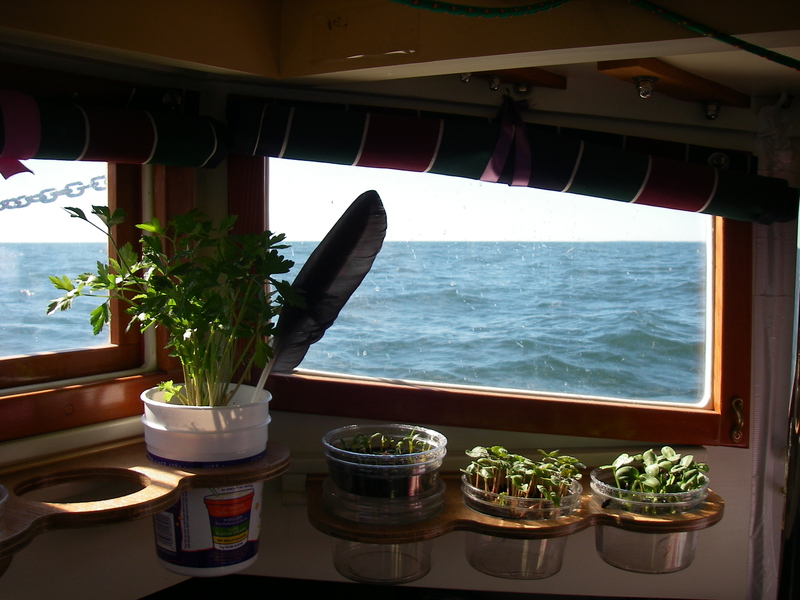 But when the weather was warmer, and the water, the boat-growing vegetables made a real difference. Besides being fun! Thanks! And I forgot the part about the aphids, which will be added to the main post in the next day or two. The bottom line is, when you start seeing aphids in the lettuce or the kale on a boat, it’s time for a harvest feast!